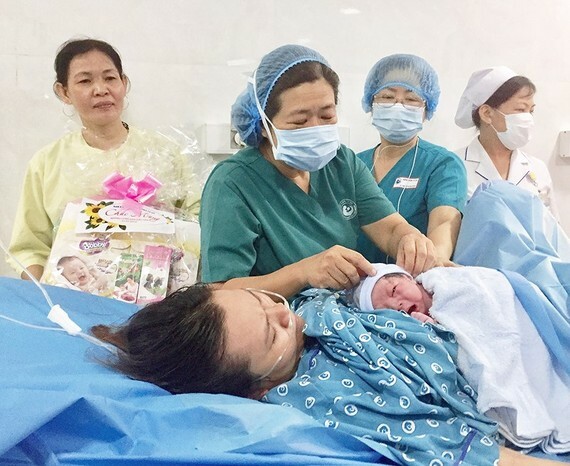 First babies born in Vietnam in 2019 arrived at midnight in Tu Du Maternity Hospital in Ho Chi Minh and the National Maternity Hospital in Hanoi. Baby Phuc was born at the midnight, weighing 3.25 kilogram and having the length of 49 centimeter. His mother Nguyet Que from the Mekong delta province of Long An, the first pregnant delivering in the New Year’s Eve, said that she and family was happy to welcome the healthy baby wishing that he will have all best things; accordingly, the mother named him Phuc. Medical workers of Tu Du Maternity were run off their feet on New Year’s Eve to be ready for welcome new citizens of the year. Also on the New Year’s Eve, four baby girls and one baby boy were delivered in the hospital in medical workers’ loving hand. Hospital Deputy Director Nguyen Ba My Nhi gifted first newborn babies saying that all medical workers wait for newborn babies of the new year. Meantime, the National Maternity Hospital in Hanoi said that the first newborn baby of 2019 was delivered at 00:03 on January 1, 2019. Baby Dam Thi Phuong Mai weighed 2.8 kilogram. Simultaneously, at 00:25, a pregnant in the northern province of Bac Giang was delivering a baby girl weighing 3.3 kilogram.